Q10 is a naturally-occurring vitamin like substance found in every cell in the human body. Coenzyme Q10 is important for the normal functioning of cells; it is involved in many of the key enzymatic processes required for the production of energy at a cellular level. Reduced levels of Q10 in the body may lead to negative consequences on health and well-being. The heart and liver tend to contain the greatest levels of Q10 and research suggests it is particularly important for optimum cardiovascular health. Bioavailability: The bioavailability of a coenzyme Q10 supplement is highly important to achieve its maximum benefits. 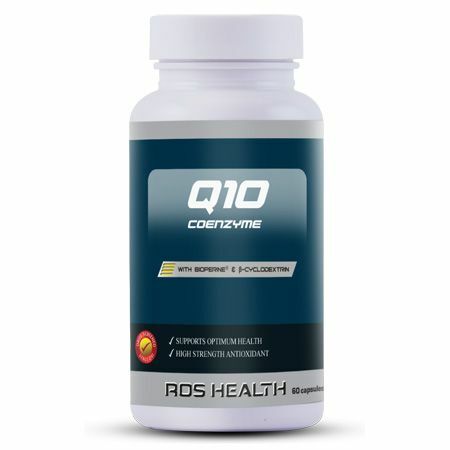 Coenzyme Q10 from ROS Nutrition is formulated with optimum amounts of Bioperine® and β cyclodextrine to increase its absorption. Deutsch L. Evaluation of the effect of Neptune Krill Oil on chronic inflammation and arthritic symptoms. J Am Coll Nutr 26: 39-48, 2007. Mori TA, Woodman RJ, Burke V, Puddey IB, Croft KD and Beilin LJ. Effect of eicosapentaenoic acid and docosahexaenoic acid on oxidative stress and inflammatory markers in treated-hypertensive type 2 diabetic subjects. Free Radic Biol Med 35: 772-781, 2003. Take one capsule daily with one of your main meals.